Theodore Roosevelt, our 26th president, developed an interest in the Navy early in life and as a student at Harvard in 1882 wrote "The Naval War of 1812" establishing his credentials as a serious historian. Among his many roles in serving his country, he became Assistant Secretary of the Navy in 1897 and was instrumental in preparing the Navy for the Spanish-American War. It was in 1902 that President Roosevelt established the Navy League of the United States. In his honor, the Atlanta Metropolitan Council Navy League of the United States will be awarding a deserving cadet from each of our units the Theodore Roosevelt Youth Medal that is awarded to outstanding Junior Reserve Officers Training Corps (JROTC) cadets and Naval Sea Cadet Corps (NSCC). 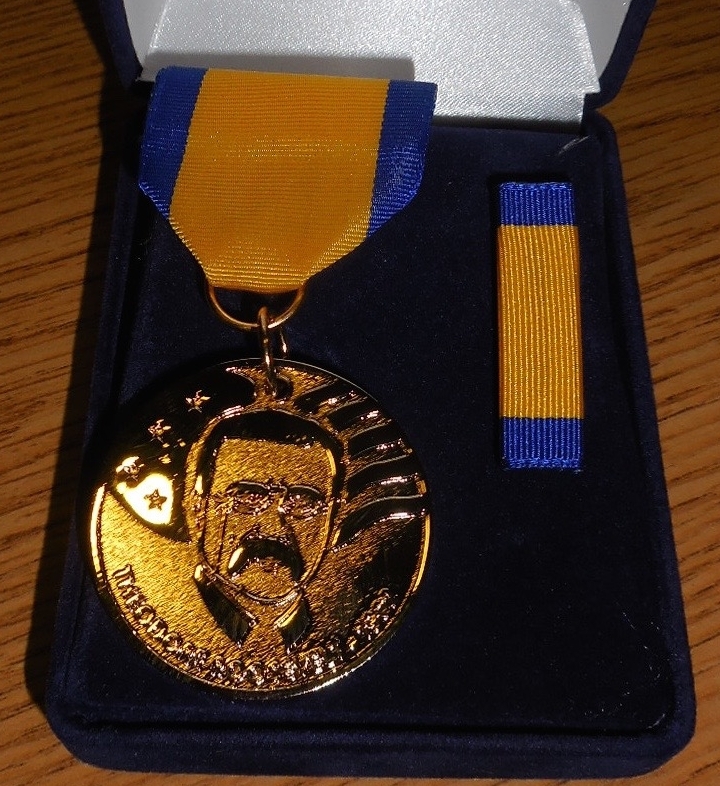 The award consists of a medal, ribbon bar, certificate, and pamphlet on President Theodore Roosevelt whose visage is on the medal. The Atlanta Metropolitan Council of the Navy League of the United States supports 9 sea cadet units and 45 Navy & Marine Corps JROTC units. Theodore Roosevelt Youth Award winners qualify for consideration to compete for the "Cadet of the Year" among all of our supported units. Last year, the Atlanta Metro Council was pleased to award over $5,000 in checks to deserving cadets: 1st Place $1,500, Runner-up $750, and Honorable Mention $250. Our guest speaker at the banquet will be CAPT Mark Pimpo, Business Consultant for Chick-fil-A Inc. in Atlanta, Georgia and attended the United States Naval Academy. This year the Youth Awards Banquet is May 10, 2018 at the DoubleTree Hotel in Smyrna, GA. Social at 6:30 pm, dinner at 7:00 pm. Hope you can join us for the 25th Annual Youth Awards Banquet celebrating our top cadets from Naval Sea Cadet Corps and Navy/Marine Corps JROTC units. For more information, contact William Wilkerson at william.wilkerson1@att.net.